As the diplomatic prospects for resolving the North Korean nuclear crisis took center stage while the military focus remained fixed on North Korea’s persistent advances and the “fire and fury” that President Trump threatened to unleash, it remained important in the first months of 2018 to keep the eyes of the international community on South Korea’s own national security options. What are the main options? What forces may determine which of them should be chosen? How will that choice impact the US-ROK alliance and regional geopolitics? In this Special Forum, we offer four perspectives on Seoul’s strategic choices, covering South Korean public opinion, the impact of assessing Kim Jong-un’s intentions, the need to strengthen the US-ROK deterrence architecture, and how Seoul’s strategic decisions may affect the alliance with Washington. The choice of strategic options matters for domestic opinion, alliance cohesion, and international relations. 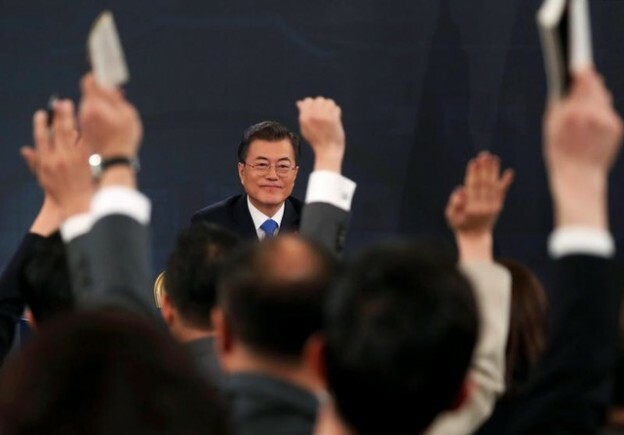 Conservatives are wary that President Moon Jae-in is not sufficiently committed to the defense of his country, while progressives fear that he will yield to pressure in choosing options not conducive to broad international support and peaceful resolution of the ongoing standoff. The decision by Park Geun-hye to deploy THAAD divided the public and provoked retaliation from China, proof that strategic calculations need to be weighed against impacts beyond alliance strengthening and defense against North Korea. As observers assess Kim Jong-un’s intentions, the implications for Seoul’s military choices are considered here from multiple perspectives. although Trump and Moon hold fundamentally different perspectives on how to resolve the North Korean crisis, the escalating crisis presents an opportunity if they could work together to disrupt North Korea’s nuclear program through non-kinetic means. Washington must take steps to ensure that it consults closely with the Blue House on all aspects of its North Korea policy, avoiding any unilateral action such as a “bloody nose” strike, and Seoul needs to avoid unilateral concessions that could lead Trump to jeopardize the alliance through precipitous actions, while avoiding the optics of untimely OPCON transfer and of rejecting collective security that would deal with the North Korean threat more effectively and pressure Beijing to be more cooperative. Drawing on public opinion data, Kim Jiyoon finds that support for the alliance is strong in South Korea. She explains that, despite Trump’s poor favorability ratings and concern that negative elements inherently operate when a conservative US government and a progressive government in South Korea have to work together, the South Korean public thinks about military options in ways that have come to favor the alliance more than before. The United States remains a strong and reliable military partner, decoupled from Trump, whose reputation has not hurt the overall importance of the United States as an ally. China, in contrast, seems to have used up its political capital due to the THAAD issue, reminding many that the country had not truly been on South Korea’s side and could take sides with North Korea in the event of an inter-Korean conflict. when the North’s missile tests and the sixth nuclear test led South Koreans to want a stronger military alliance with the United States than ever before. South Koreans decoupled how they view the United States and its president. How long this will last is not clear. Some of Trump’s words were not just critical but also insulting to South Korea. Yet, if his rhetoric begins to be realized in his policy and South Korean interests are hurt, this could affect people’s sentiments toward the United States. In 2017, 95.6 percent of respondents answered that they thought the ROK-US alliance was necessary. The differences across generations, ideological stance, and party affiliation were all minimal. In fact, the number had increased by 1.5 percent from answers in 2016, and it is the second highest rating following 96 percent in 2013. Regardless of Trump’s tweets, South Koreans found the alliance very important in the face of the North Korean threat. The memory of the Korean War where China fought against South Korea and the United States, remains alive among many South Koreans, and China was still seen to be a communist country. If a changed perspective could be seen emerging in 2013-15, this was sharply reversed in 2016. A disproportionate number of South Koreans believe that China would take the side of North Korea were another Korean war to break out. In 2010, 60 percent answered that China would take the side of North Korea in that case. The number had increased to 75.9 percent in 2012. But in 2015, the proportion of the public who thought China would not take the side of North Korea (56.8) was even higher than that of those who thought China would (43.2). It was a good year for the two countries’ relations, and people’s favorability score for China went up as well. But those who believed that China would not take sides with North Korea decreased to 33.3 percent in 2016, and in 2017 to 30.2 percent. In March 2017, the Chinese favorability rating among South Koreans recorded its lowest score ever at 3.21–even lower than the Japanese favorability rating. For South Koreans, THAAD was an unavoidable choice in the face of the continuous North Korean provocations. As news of the Chinese retaliation was reported, South Koreans became furious, criticizing the Chinese government. China being uncomfortable with THAAD deployed in South Korea was understandable to a degree, but many believed it should have restrained North Korea if it hated THAAD being deployed. Even for those who did not approve of the deployment, China’s aggressive economic retaliation was negatively perceived as an unfair, unilateral assault by a superpower. South Koreans turned against China in light of THAAD. When asked which country would be the most threatening after unification with North Korea, Japan was viewed as the most threatening at 48.9 percent followed by China with 32.7 percent in 2015. The numbers were dramatically changed in 2017: 62 percent chose China; only 18.1 percent chose Japan. The debate surrounding THAAD deployment clearly affected South Korean views of China—as well as of the United States. As imminent threats from North Korea accumulate, reliance on the alliance becomes stronger. As ties with China go sour, the feeling that the United States is the only reliable partner deepens. As North Korea escalates its nuclear and missile threats, the necessity for the alliance with the United States perceived by South Koreans has grown stronger. Although perplexed, South Koreans have been little affected by comments from Trump in how they view the United States. Attitudes toward the alliance have rather become more supportive. China’s economic retaliation provided an opportunity to reconsider relations, deciding that it is not a reliable partner when it comes to security. Support by South Koreans for the US alliance is higher than ever. And, so far, the Moon government does not seem to be very far off from what the United States requests regarding North Korea policy. However, a fracture between the allies could arise. What South Koreans are attentive to, besides the security alliance, is bilateral trade. Why and how China lost its magic charm so quickly is a good example. As Trump’s threat to KORUS FTA continues, we cannot exclude the possibility that this would hurt America’s image among South Koreans. As seen in the Chinese case, being controlled and threatened by a superpower is most unforgivable. Austin Long first frames two versions of North Korean intentions, presenting a very benign and then a very malign interpretation. Second, he presents two policy options responding to those versions in stark terms in order to define the spectrum of options. He concludes by exploring how and where elements of these policy options can be combined and what aspects of them are inevitably in tension. The benign interpretation is that Kim is essentially a version of Nikita Khrushchev, willing to take risks and cause crises but who believed co-existence was possible and that nuclear weapons would allow economic reforms. The malign interpretation of Kim Jong-un’s intentions is that he is a version of Saddam Hussein, inclined to chronic misperception of the United States and its allies along with a view that nuclear weapons would enable him to effectively change the status quo. Long pursues both of these analogies. The more benign argument treats the “byungjin line,” announced in March 2013 calling for both economic development and a strengthened nuclear program, as analogous to Khrushchev’s policies. A stronger nuclear program may open the door for eventual reduction in conventional forces to further enable consumer focused economic development. In this viewpoint, Kim is focused on preserving his regime, the pillars of which are economic reform and nuclear weapons. Saddam also viewed nuclear weapons as a means not just to defend Iraq but also to achieve his regional ambitions to change the status quo. Personality quirks and biases led him systematically to underestimate the risks of crisis, and Long asks whether Kim Jong-un is similar in his risk assessments of South Korea and the United States, especially now that he believes he can strike the United States with nuclear weapons. Like Saddam, he has ruthlessly purged those who might threaten his control of North Korea, and so his subordinates may be reluctant to bring him bad news, and like Saddam, he may read US and South Korean restraint in response to events such as the 2014 Sony hack as signs of weakness. He may be willing to run serious risks to shape the future of the peninsula. Nuclear weapons may be the lynchpin of coercive efforts, which go far beyond regime survival. The benign version of Kim’s intentions, Long argues, leads to a policy intended to avoid a spiral of confrontation driven by the security dilemma, but efforts to significantly bolster deterrence may backfire, as Kim Jong-un may conclude the United States and South Korea are actually implacably focused on ending his regime. Yet, to the extent this version is accepted in Seoul, as appears to be reflected in the recent North Korean outreach, the ultimate political objective would be a mutually acceptable peace treaty to formally end the Korean War, with both sides embracing the principle that reunification will not take place through force or coercion. This policy is consonant with Moon Jae-in’s emphasis on the dialogue component of his two-track North Korean policy while deemphasizing (but not eliminating) the sanctions component. This means deemphasizing deployment of systems and forces most likely to cause security dilemma driven spirals- such as ballistic missiles and special operations units targeting North Korea’s leadership, even if a continuation of North Korean low-level confrontation (e.g. cyber operations) with South Korea and especially the United States is likely even in the most benign view. The goal of this policy would remain to avoid a spiral to serious crisis that could lead to war. The risk of war is most acute, in the malign view, if Kim believes Seoul and Washington lack the stomach for confrontation, particularly now that Kim has “completed” his nuclear arsenal. If so, this supports the “maximum pressure” campaign, limiting policy negotiations and outreach to North Korea only in close consultation with the United States, while Kim Jong-un would know that Seoul had the capability to target the one thing he surely cares about- his own survival. A robust combination of “ISR [intelligence, surveillance, and reconnaissance], strike, and missile defense capabilities would make coercive nuclear escalation significantly riskier for Pyongyang. Long cites evidence supporting both the benign and the malign versions of Kim’s intentions and finds little clarity about which elements are dominant. The same is true of current South Korean security policy, which has some elements intended to avoid spirals of mistrust captured in the Ministry of Unification policy, and others intended to bolster deterrence, described in the Ministry of Defense White Paper. In these circumstances, the guiding principle should be the search for “optimum instability,” requiring sufficient military capability to convince Kim Jong-un that his nuclear forces are not useful for anything other than deterring major attacks on North Korea, while reassuring Kim that attack was not imminent and peaceful co-existence possible. Elements from both national security policy options can be combined in pursuit of optimum instability, but, ultimately, the weight of policy will fall towards one side of the spectrum or the other based on assessments of Kim’s intentions. South Korea’s national security community must decide whether the risk of war is more acute from failing to avoid a spiral or failing to deter. Seol In-hyo and Lee Jang-wook assert that the recent rapid increase in the North Korean threat poses a critical challenge to the ROK-US alliance, the key factor in successfully deterring another war. They warn that the military option, attacking North Korea preemptively, cannot be South Korea’s choice, because there is undeniable risk that military conflict would ensue, perhaps leading to a nuclear exchange. Admitting the North as a de facto nuclear state also should not occur. They propose, instead, to build a more reliable, stronger deterrence architecture to effectively deal with the military challenge because it would provide an unshakable foundation for denuclearization negotiations, which may last for a considerable time. This is called “tailored” deterrence, signifying that the alliance continues to tailor the best-fitted deterrence posture through close coordination. Success, they warn, heavily depends on a mutually shared understanding of the situation and effective countermeasures. The rapid increase in the North Korean nuclear and missile threat is raising unique challenges to the alliance, but professional debates have been limited, and the general public is not well informed on related issues. No one can be confident that preexisting theoretical perspectives can be applied to the North Korean case before being properly tested; they advise debate and theoretical testing as the starting point for the more muscular deterrence they propose. Seoul and Washington have a strong will to denuclearize North Korea; however, the two seem to have a different approach to it. One stresses a diplomatic resolution to keep the balance between pressure and engagement, while the other focuses on maximum pressure with emphasis on not repeating failed methods and being deceived again. Since North Korea publicly declares that it can directly attack the US mainland with nuclear-tipped ballistic missiles, the problem threatens core US security interests. When missiles could only target US allies, it was primarily at the allies’ discretion how to respond since this was directly related to their security interests and only broader US national interests. However, after it was realized that the North was becoming close to an ICBM capability, allies anticipate that the United States may dictate how to address the North Korean problem, and they will not be able to block it. The United States may prefer the military option because it is better than allowing North Korea to finally accomplish its goal of ICBM capability to attack the US mainland, which would make military options impossible. If North Korea finally accomplishes its nuclear and ballistic missile program goals, it may be able to threaten the United States into not retaliating even if the North invades and attacks US allies. Due to that risk, South Korea and Japan may be urged to create their own nuclear weapons. Seoul and Washington need to have a shared perspective on the current military balance on the peninsula and on the main theoretical points of deterrence, the foundations for designing the architecture. However, some experts argue that Pyongyang only seeks regime survival, and its aggressive behavior just reveals its vulnerability. Others contend that the North has a goal of conquering the entire peninsula and denying US operational access there. North Korea’s threat should not be underestimated, but rather overestimated since nuclear weapons are so fatal. It would be difficult to ignore the criticisms based on the worst-case scenario in the process of rational decision making on national security, Seol and Lee conclude. In the past years, the alliance defense policies against North Korean provocations have been limited to continuation of ad hoc reactions as opposed to “the big picture,” which looks to North Korean future provocations. Some countermeasures lost most of their military effectiveness even before they were completed. “Kill Chain” was designed to strike the missile launcher during its preparation roughly within a half an hour. However, as the North introduced solid fuel ballistic missiles and reduced the preparation time dramatically, it was not expected to deal with them. The grand design of a deterrence architecture needs to be mapped out to overwhelm the North Korean plans and timetable to develop its nuclear and missile capabilities. If North Korean military aspirations and its future vision can be disturbed in advance by this grand plan with the toughest economic sanctions and political isolation, its nuclear and missile capability could be relegated to be only a burden. The debates on the use of a military option as a solution to the North Korean problem can also cease since there is a highly effective and safe alternative. The grand design to strengthen a deterrence architecture on the Korean Peninsula is expected to be effective to force China and Russia to do more for North Korean denuclearization. The aim is to make the North realize that nuclear weapons bring more of a cost than a benefit. Military power should be used to impose more costs on the North’s nuclear armament. This idea can be called a “cost imposition strategy.” Enhanced counter force capability can be one of the cost imposition measures. If ROK intelligence had a list of the North’s political elite, the location of their shelters and the capability to strike them, North Korea would face hardship from the ROK’s retaliation capability. This means threatening the dictator himself to deter North Korea. The ROK-US alliance should achieve North Korean denuclearization based on mutual trust and cooperation, building a more reliable and stronger deterrence architecture designed to impose heavy costs on North Korea. It would be highly difficult to come to agreement on many issues, but at least it is possible to exclude the extreme arguments. By gaining confidence that we will win the race even without fighting, we can finally achieve denuclearization of North Korea. Viewing the North’s 2018 charm offensive as wildly successful—the “princess of Pyongyang,” has done much to put a human face on the totalitarian regime—Sue Mi Terry argues that despite US agreement to a slight thaw in inter-Korean relations by postponing the annual US-ROK military exercises and now being willing to sit down and talk with the Kim Jong-un regime, danger lurks for alliance relations. She argues that Moon was right to open lines of communication with Pyongyang and invite North Koreans to participate in the Winter Olympics, but since the US alliance remains the cornerstone of South Korean security, he would be well advised not to risk accommodating North Korea—an effort likely to fail. In the past, the North always demanded lucrative concessions in return for its willingness to talk. Summit prices in 2000 and 2007 were particularly lucrative for the North. Under Kim Dae-jung and Roh Moo-hyun, over $8 billion in subsidies and assistance flowed from South to North. Kim Jong-un sees his Olympic outreach as the first step of an attempt to win a relaxation of sanctions. He is determined to break apart the international sanctions campaign and sees Seoul as the weakest link in the “maximum pressure” chain. From the North’s perspective, the détente with Seoul buys it much needed time and reduces the chance of possible kinetic action against the North—the United States is less likely to bomb the North if it is engaged in talks with Seoul—while driving a wedge into the US-South Korea alliance. Moon must avoid the trap that Kim Jong-un is setting, trying to take advantage of his hopes for peace to snooker South Korea into making unilateral concessions. If South Korea were to make concessions now to North Korea, without the North having done more to earn them, it would place itself in an impossible position with Washington. Trump came into office hinting that he might scrap the US-South Korea FTA and even pull US troops out of South Korea if Seoul did not pay more for their upkeep. He could well do so if he thought that Seoul was undermining his get-tough approach with Pyongyang. He wants to stop it from threatening Washington with nuclear destruction, and he could take actions that would jeopardize the alliance with Seoul. Moon appeared to have reassured Pence that South Korea will not ease up on the sanctions or pressure until the North gets serious about dismantling its nuclear program. As a result, Pence was also able to concede to Moon that, as long as “maximum pressure” was sustained, the United States would support an inter-Korea summit. He expressed willingness for US representatives to sit down with the North Koreans. Washington and Seoul, recognizing that sanctions require time to work, need to continue to maintain unity. If Seoul were seen to be out of step with Washington, Trump would be more likely to act unilaterally, even to launch a preventative strike. Moon can help in restraining him from precipitous action if he follows America’s tough line on sanctions, while he reaches out to the North to see if any diplomatic breakthrough is remotely possible. Moon could meet with Kim Jong-un to see what may be possible—but without making any preemptive concessions that Kim has not earned. Even if a breakthrough is not forthcoming, talks could be useful in assessing the North’s intentions and preventing accidental conflagration. Terry observes that there are now more uncertainties in the alliance, attributable to changes in the leadership in Seoul and, more importantly, in Washington. Despite efforts by both capitals to portray the relationship as stronger than ever, the Moon administration is likely unnerved by the Trump administration and recognizes that the two allies are, perhaps, at the most fraught moment in the history of this bilateral relationship. Trump’s incendiary and intemperate rhetoric has not helped in alliance management, while the Trump administration is troubled by what it perceives as a Sino-ROK understanding, if not an agreement, on the “three noes.” Even as the Blue House tried to alleviate its concerns by saying that this was not a formal agreement, it was nonetheless seen as Seoul conceding to Beijing a voice in its future security options. Further deployment of THAAD may be necessary. Washington hopes to move the bilateral alliance in the direction of collective security to deal with the North Korean threat more effectively. Strengthening trilateral defense cooperation between Washington, Seoul, and Japan makes sense particularly in deterring the North Korean threat. Moon’s move stands in the way of such actions. As for a broad security architecture to contain the growth of Chinese power, this is the last thing Beijing would like to see, and it will apply all the leverage it can on Seoul to avoid joining such a US-led coalition. Moon should respond to the Trump administration’s concerns by presenting an alternate plan that would be appealing to the administration. Terry suggests increased deterrence and gradual rollback of the North Korean threat, including through a trilateral defense alliance. Despite Seoul’s weariness to strengthen defense cooperation with Tokyo and Washington, this very movement towards a regional collective security arrangement would put real pressure on Beijing to rethink its North Korea strategy. China still has not fundamentally shifted from its strategy of sustaining the Kim dynasty in the hope of ensuring a fnation on its border to provide a buffer between it and the democratic, pro-American South Korea. But if the United States were to strengthen missile defense and cooperation with its allies in the region, it would put additional pressure on Beijing. By taking legitimate steps to strengthen mutual defense with Washington and Tokyo, Seoul would have an opportunity to shift China’s strategic calculations vis-à-vis Pyongyang while lessening the probability of Washington ultimately resorting to kinetic action against North Korea. If taking steps toward trilateral defense cooperation is too big a move now, Seoul should at least think about agreeing to a collective security statement with Washington and Tokyo that an attack by North Korea against any one of the capitals would constitute an attack on all. The leadership combination of Trump and Moon has presented a new and fundamental challenge to the alliance, Terry notes. The two hold fundamentally different perspectives on how to resolve the North Korean crisis, but as much as the escalating crisis has highlighted strain in the alliance, it also presents an opportunity. If Seoul and Washington could work together to disrupt North Korea’s nuclear program through non-kinetic means, the alliance would emerge stronger than it has ever been. Washington must take steps to ensure that it consults closely with the Blue House on all aspects of its North Korea strategy and policy, avoiding unilateral action such as a “bloody nose” strike against North Korea that would spell the end of the US-South Korea alliance. At the same time, it should increase the credibility of its extended nuclear deterrence, Terry concludes.